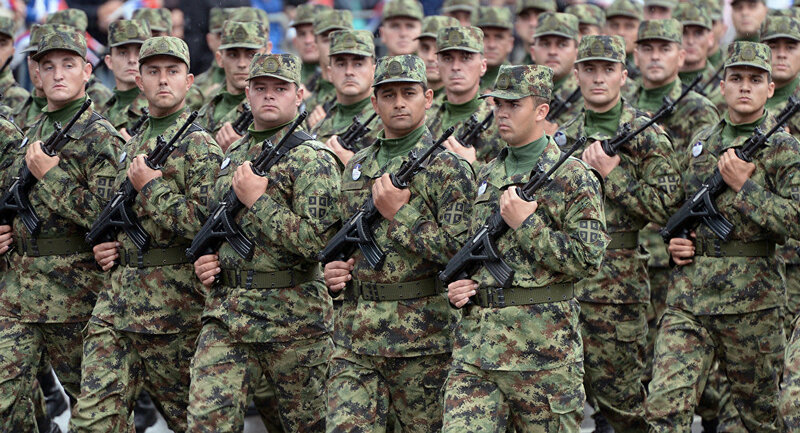 BELGRADE (Sputnik) - Serbia on Saturday launched the biggest military exercise in the country's history involving 8,000 soldiers to mark the centenary of the end of World War I, a Sputnik correspondent reported. The drills, dubbed the Age of the Winner, are being aired by the Serbian national broadcaster RTS. "The latest exercises, the scale and complexity of which could be compared to the Age of the Winner were the Freedom and Unity exercises that took place back in 1971 and 1975. Since then no one dared to or could demonstrate such strength and organisation," Serbian Defense Minister Aleksandar Vulin said, commenting on the matter. According to the minister, 100 М-84 tanks, 100 armoured infantry fighting vehicles, more than 60 River Flotilla vessels and 24 planes and helicopters are involved in the ongoing military exercises. The drills come a few weeks after Serbian President Aleksandar Vucic addressed the plans of the Kosovo administration to turn its security forces into a 'NATO-compatible army,' stating that the move would violate the breakaway region's own constitution and the spirit of all its agreements with Belgrade.